Emergency & Trauma Care Services at Capitol Hospital is focused on one principle – saving human life. With this thought in mind, our emergency team at Capitol works round the clock on 365 days annually because we understand how precious your loved ones are. Being the best super specialty hospital in the region, we are equipped to handle all life-threatening and serious medical & surgical emergencies round the clock. 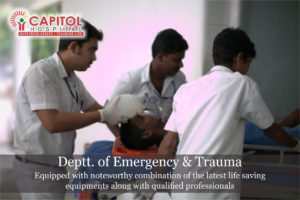 At Capitol, we are equipped with a noteworthy combination of the latest life saving equipment along with qualified doctors, nurses and paramedics who ensure that the patient gets the best of services in the shortest possible time that too in a supportive environment. EMS or Ambulance service of the hospital is the most visible part of the emergency department to the public eye. Every emergency department has a triage or triaging area to sort incoming patients according to priority. This prioritization of patient care is usually based on the severity of injury / illness, prognosis, and availability of resources. The four level of triaging system is usually followed. This area is dedicated to the immediate care of patients and victims in cardiac arrest, airway, breathing and circulation compromise. The ‘Resus’ area has all resuscitative equipment like monitors, defibrillators, airway, intubation & surgical equipment available and ready at an arm’s distance including pediatric resuscitation kits. A patient can be shifted to the Resus area from outside or from an area within the hospital or emergency department itself. All priority I patients are managed here. Priority I patients have life threatening conditions which can be survived with immediate treatment. All priority patients are managed here. By priority II, we mean patients who require definitive treatment but no immediate threat to life exists in these cases. This area will thus have dedicated emergency physicians with nursing staff, who look after the patients in this area. Since majority of the patients coming to an ED do not have an emergent problem which needs to be addressed on immediate basis, they are assessed and treated on outpatient basis in the consultation rooms. Procedures like washing, dressing & suturing of wounds, reduction & splinting of fractures & dislocations and other minor surgical procedures are done here. Any major emergency surgery can be conducted here by the operating team of physicians. Patients who need to be admitted and observed for less than 24 hours are placed here. Such patients are those with non cardiac chest pain, acute asthma, vague abdominal pain, minor head injury, acute depression, febrile convulsions, dehydration etc. Dedicated staff from emergency medicine looks after these patients. Prayer room is an important part of any emergency department since patients and victims are very serious or sick. It provides privacy for the relatives and attenders of the patients to perform any prayers. The prayer room usually is an empty room without any pictures or images so that people from any religious background can use it. At Capitol, we ensure that patients and attendants have access to all the basics while their patient is undergoing treatment.